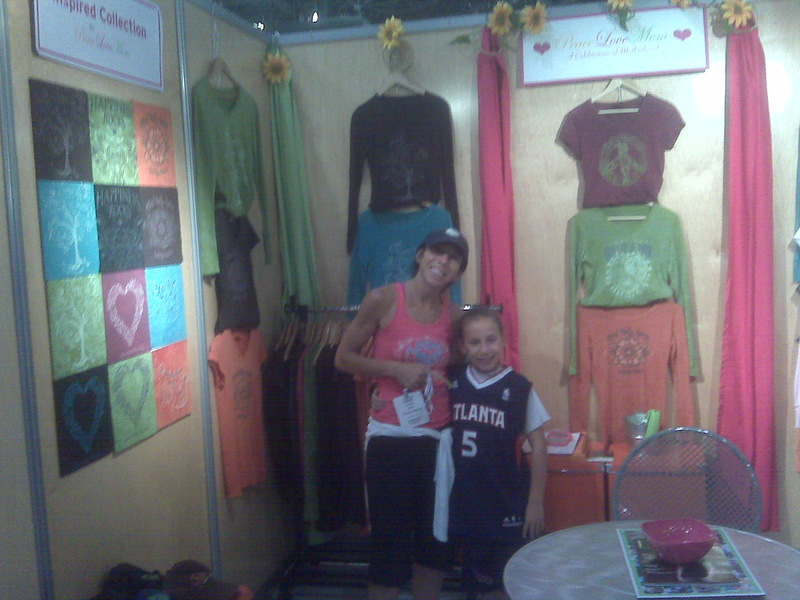 Almost finished booth with my daughter, the helper, in her new NBA outfit! Thought you might like a glance in a "PeaceLoveMom" day as we set up our booth for a trade show. We are in New York at Accessories the Show, Javits Center, Aug. 1-3, booth 1744. Remembering that we are still on summer break, I thought it would be a great idea to combine work and fun with one of my daughters. After all, I was going to New York. The day began with an official New York bagel and a diet coke. Of course, not for my 10 year old. I am one of those "No soda for kids" parents. Also known as, "do what I say and not what I do." I drink about 6 diet cokes a day! It was awesome to eat in Central Park. Nothing! The booth is empty, totally empty. Our booth was delivered but seems to be lost in the building. Three hours later our booth is found and the fun begins - ALONE. My sister and my daughter leave to go have fun. By fun, I mean shopping. By shopping, I mean at the NBA store. Need I say more. I open the cases. Missing are samples of our hottest new designs, our PR, and the steamer leaked all over the booth signs. Good news was the booth next to PeaceLoveMom was blasting great music! I just starting singing and setting the booth. I am a terrible singer, but no one complained. I think they just felt sorry for me. Plus we have great candy and we always share. My sister and daughter return at 6pm to help me wrap it up. We steam, hang, stick up boards, post signs, adjust lights. It was a long day. Glad to have the help. I will arrive early in the morning for some touch ups. Hope the show goes much easier than the set up. Keep you posted. Wish me luck.